It is not my intention to renovate the Tip of the Tongue to make room for a forum for compare and contrast essays and expositions. Yet since I’ve arrived to Boston, I’ve visited a restaurant that perhaps rivals Atlanta’s The Real Chow Baby. After a visit, some thoughts bombarded my mind- for one: the fact that I needed to talk to you. I have since spoken with a few people that have provoked me to finally state the differences, for better or worse between Chow Baby and Fire+Ice. So have a seat! Let me tell you how Fire+Ice sets the table. My party and I were shown to our table, shuffling into our seats nestled into a niche hidden in the dark. We were ushered into more of a club vibe than a restaurant ambiance. At each place setting, there was a fork and knife on either side of a large white bowl, in whose depths lied the prospect of culinary possibility. There was also a menu listing some appetizers and drinks, as well as desserts, of course centered around the theme and mechanics of the restaurant. 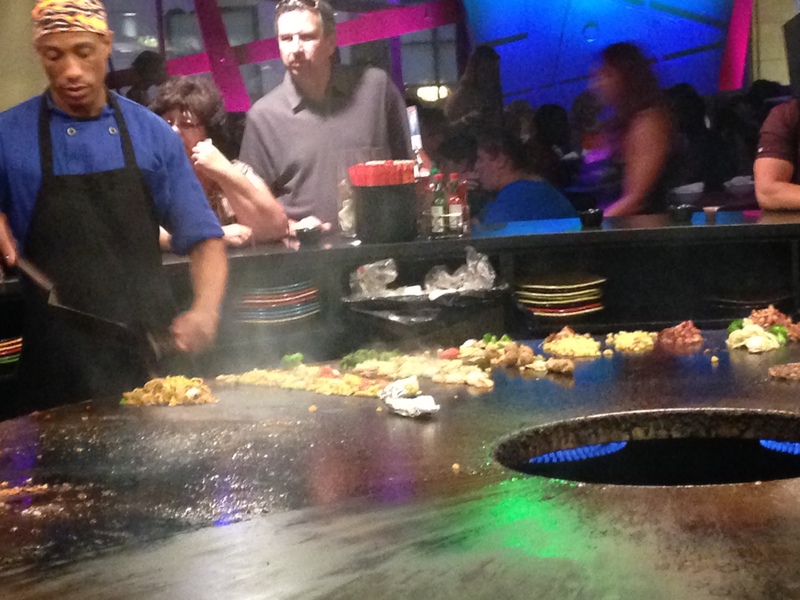 Fire+Ice, like Chow Baby is an all you can eat stir-fry concept. Unlike Chow Baby, Fire+Ice reaches out to the rims of the global plate, aiming to tickle every taste bud, boasting a diversity of not just Asian, but also Latin, Italian, and, of course American flavors. You can go from cheeseburgers and ribs to shrimp tacos and rice, or maybe chicken lo mien! There was rice, pastas, and potatoes; butternut squash, red beans, and green peas; Cajun spiced chicken, Italian sausage, and mussels. You could dress your masterpiece in a coat of barbecue sauce, bathe it in marinara sauce, or freshen up with a splash of sweet and sour sauce. Unfortunately, their offerings spanning the globe, their buffet wasn’t much of a road map. Fire+Ice wasn’t as logically or suggestive laid out as Chow Baby, where starches led to the veggies, the veggies to the sauce, sauce to the meat, meat to the seasonings, and finally to the grill ; proteins were gathered in a small red bowl and everything else in a larger black one avoiding cross contamination. Fire+Ice’s selections are scattered about, with some apparent order but none coherent; starches, vegetables, and proteins hugged the walls, the grill warmed the center of the floor, the sauces, fresh herbs, and spices stood between the two. Your choice of any of these was packed into a small metal bowl (after using the more generously sized one initially found among the table setting) and then delivered to the cook. One of the cool things about the restaurant is that after deciding on a combination you think is worth trying, you place your dish on the counter awaiting the cooks dexterous hands. 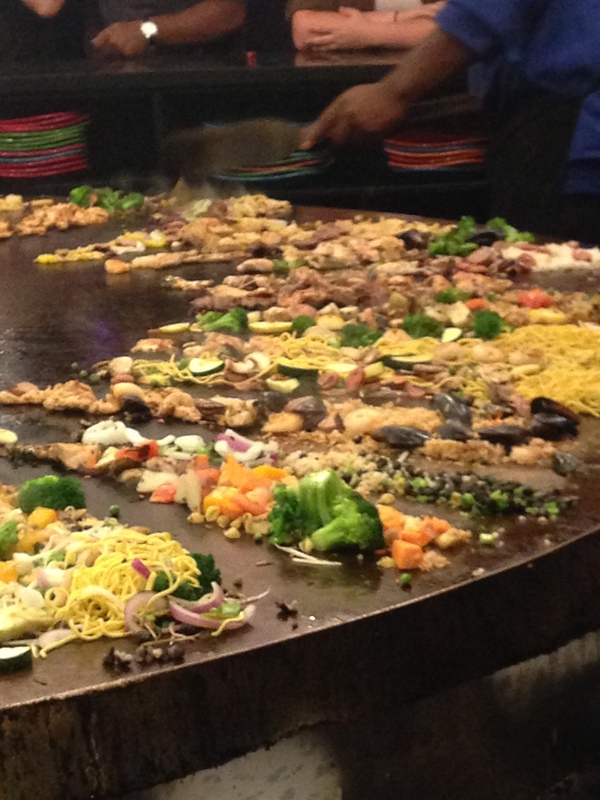 If you’re lucky (or if the cook is skilled) enough, he will show off a bit, sort of like what you might see at a teppanyaki style restaurant like Bennihanna. Check please! There is a $10 difference between the two establishments. 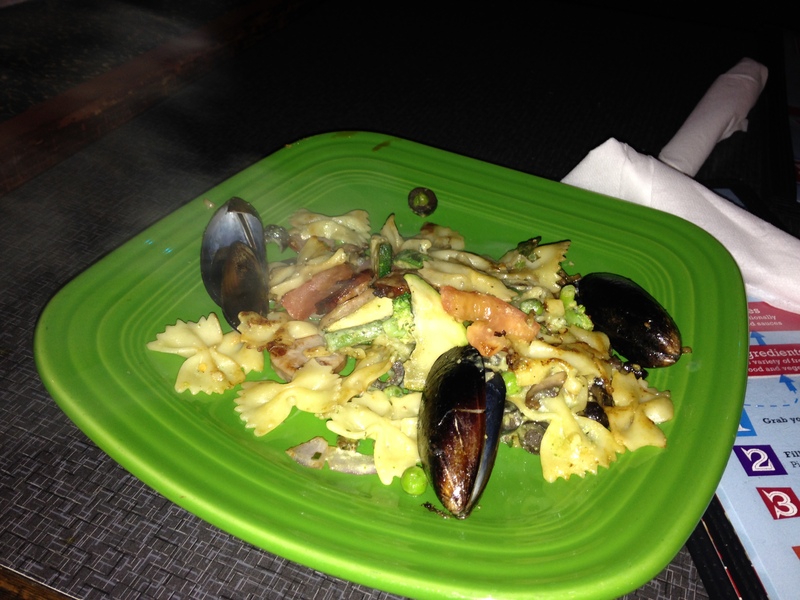 Fire+Ice burns a $24 hole in your wallet for dinner while Chow Baby will lighten that wallet of yours by $14. Granted, the two restaurants are located in two totally different cities. Otherwise, the best I can do to justify Fire+Ice’s greater pricing is recognizing that Fire+Ice offers a greater range of foods, particularly the proteins which include may include salmon, tuna, and shrimp, or ribs, pulled pork, or shredded beef. Chow Baby does offer some of these, as well as other customizable items but with an up charge for each item. For a good enough meal though, who’s not willing to pay? 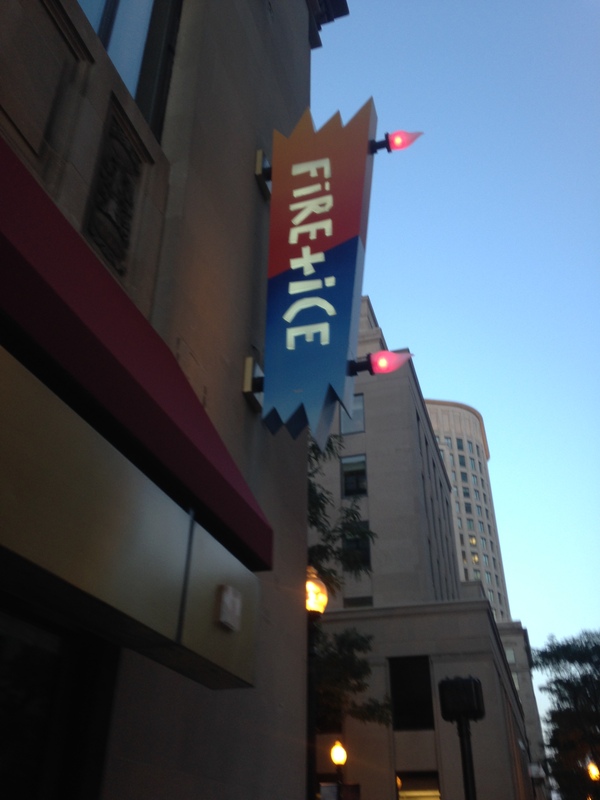 All in all, after checking out all my thoughts regarding the restaurants presented before us, though Fire+Ice sounds great, objectively considering their worthy offerings, my typing fingers more eagerly reveal the things I wished Fire and Ice would have had. 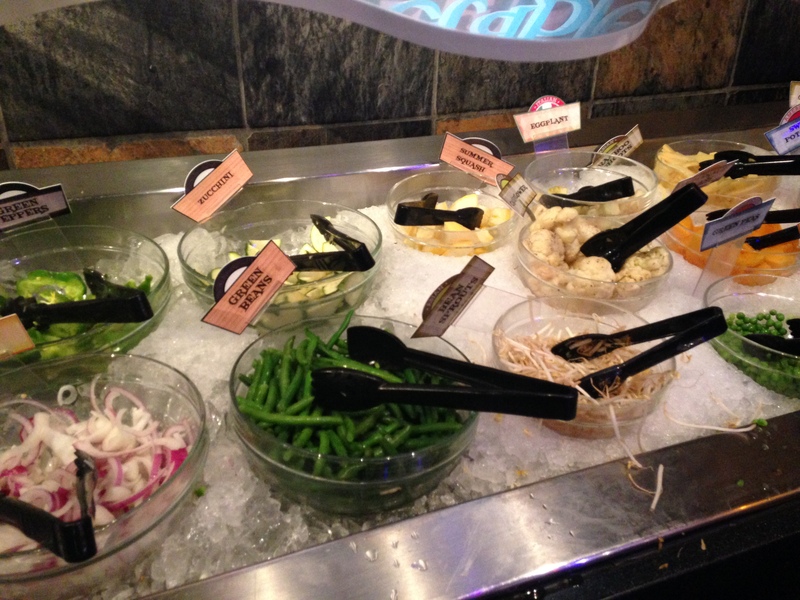 This general all-you-can-eat stir-fry concept is clearly a clever one. The perfect experience lies somewhere in the middle, yet the balance teeters and totters in the favor of the Real Chow Baby, for which I have more fond memories.